Members of the Mochida Family wearing identification tags awaiting the bus. Dorothea Lange, Hayward, California, May 8, 1942. National Archives and Records Administration. A major exhibit at JAMSJ captures the mass removal and incarceration of some 120,000 people of Japanese descent, two-thirds of whom were citizens of the United States. These individuals were forcibly removed in 1942, and most were initially held in 16 temporary detention centers euphemistically called "Assembly Centers." They were subsequently moved to 10 desolate permanent camps in the interior of the country. Most were detained in the camps until 1945. 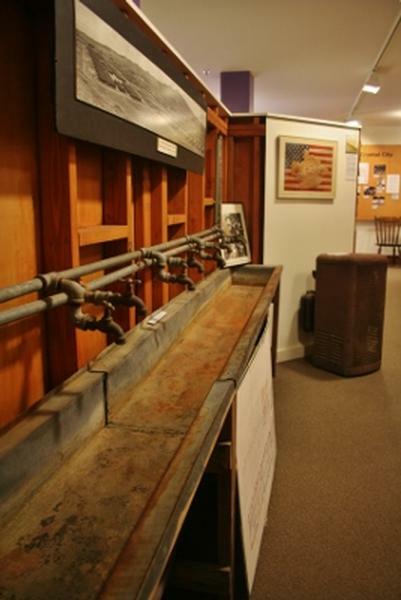 The exhibit features an extensive collection of photographs, artwork, handicraft, and other artifacts from the camps, such as an actual wash basin, window, door and barbed wire from Tule Lake Segregation Center. The federal government concluded in the Civil Liberties Act of 1988 that the causes of incarceration were due to wartime hysteria, racism, and a failure of political leadership. The event challenges all of us with the concept of what does it mean to be an American? Are you disloyal or unpatriotic if you question the policies of the federal government? What does it mean to have your rights taken away without due process? Should you discriminate against others or scrutinize someone differently based on their ancestry, appearance, religion, gender, or sexual orientation? Can it ever happen again? Dorothea Lange photograph of Japanese-American children reciting the pledge of allegiance. A Japanese internment camp guard tower at Heart Mountain (National Archives).